There is a saying that some people count time, while others make time count. This book is about making time count. It’s about managing your time effectively so that you can get the most out of each and every day of your life. It will start by helping you to set your priorities and objectives. If you are involved with a business, a plan can help you establish those goals and this book provides reviews of a number of software programs which can help you. If you are not in business, it shows you how job descriptions can be used to set your priorities. The next task is to organize your priorities into the ones which are the most important down to those which are the least pressing. It provides tips on how to handle time consuming activities such as replying to e-mail, faxes and snail mail. You will be shown how to create time blocks. You will read about wall planners and how spreadsheets and software could assist you in managing your time. If you are involved with other people in a project, this book will describe some project management software which could help you manage them more effectively. As you know, meetings and conferences can eat up a lot of your precious time, so some suggestions are offered on how to make meetings more effective and take less time. You will be given a review of some software programs which can help with online conferencing and interactive learning, so as to cut down on travel time. Sooner or later, you will be faced with a crisis when your swamp is suddenly full of hungry alligators. This book will provide you with some suggestions on time management during a crisis and also give you some tips to help you prevent a crisis from happening in the first place. Being organized is a key component of time management and a whole chapter is devoted to showing you how a number of software programs can help you. In addition, customer relationship management software can assist you with the effective time management of your customer or client contacts. Finally, this book suggests that time management is dynamic and you should monitor your progress and make changes when necessary. It will help you get the most out of every day! Chapter 9: Let's Get Organized! 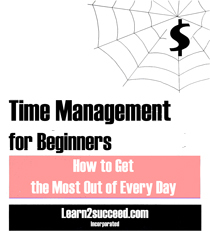 Time Management for Beginners: How to Get the Most Out of Every Day by: Learn2succeed.com Incorporated: Softcover; 114 pages; ISBN: 978-1-55270-453-0 published in 2012; $19.99.